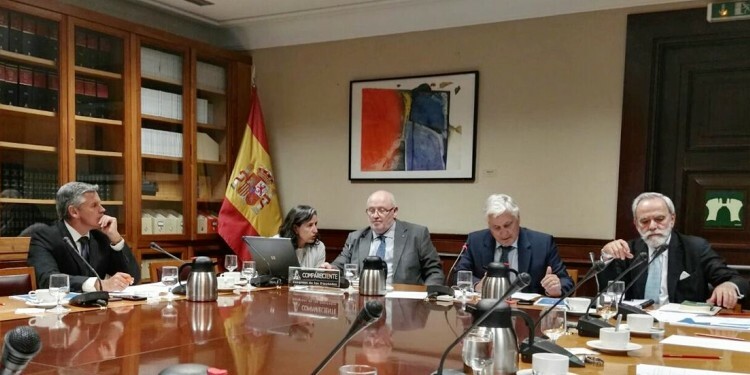 On 27 September 2017 EUROMIL’s President Emmanuel Jacob, was invited for a hearing at the Spanish Parliament in Madrid. The subcommittee for the study of the professional system of military troop and seamen of the armed forces, was created within the Defence Committee, by the Congress of Deputies on 2 February 2017. This subcommittee is an integrated parliamentary working body composed of twelve members and chaired by Mr. José Maria Barreda Fontes, President of the Defence Committee. The subcommittee aims to analyse the current situation of professional troop and seamen as defined in the law 8/2006. By means of hearings and collecting information and documentation, the twelve members have the task to prepare a report for discussion and approval by the Defence Committee. Currently, Spanish soldiers and seaman serve until the age of 45 years and must leave the Spanish armed forces when they reach this age. The legislation foresees that these men and women will be supported when reintegrating into the civilian society and labour market. Integration in the labour market is a crucial factor, as these former soldiers and seaman are only entitled to a monthly income of about 600 Euro after leaving the armed forces. Unfortunately, these men and women were not, as foreseen, supported in their reintegration process. In other words, they are “dropped back into the civilian society” empty handed! EUROMIL was invited by the subcommittee to share its experiences on such limited time careers and to comment on the Spanish case. The meetings of the subcommittee are behind closed doors and therefore EUROMIL is not allowed to report on the content of the debate which it nevertheless considers as open and fruitful. In his presentation on EUROMIL’s experiences with military short-term careers, President Jacob focussed on the need to have young operational personnel. He stated however, that short-term careers and lifetime careers must be attractive for the personnel concerned and the armed forces as such.